WOW! I don’t even know where to begin on this wedding. Details everywhere, love, laughter, tears, amazing family and friends, and vendors all to make Megan and Caleb’s day perfect. Let’s not forget an epic flower confetti toss and the rain that started just as they drove off in the jeep! William and I drove in from Oklahoma to capture Megan and Caleb’s day and we were so glad they asked us to capture it. Once in Rolla, the clouds showed a threat of rain last Saturday as we pulled up to the church. Not too surprising for a fall day in Missouri. We love how the clouds give everything a beautiful pop of color and it didn’t keep us from being able to capture their day, in fact it just stopped raining for us during portraits and everything was beautiful. God even sent a rainbow! Megan and I had been chatting about details from the beginning and she had so many ready for me when I arrived! I was able to quickly gather them up before joining Megan as she got her hair finished. I loved the colors she chose for her wedding. They went perfect with this autumn season and her personal style. 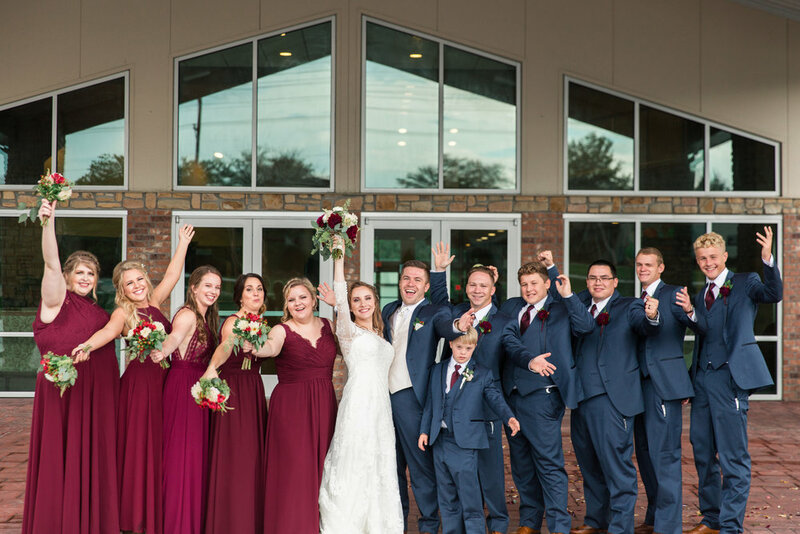 From little white pumpkins and candles on the tables at the reception, to a gorgeous splash of burgundy mixed in with hints of gold, and the guys all dressed up in a perfect shade of navy! You could tell Megan had been planning her day for a long time. Caleb and Megan were high school sweethearts! Their story goes way back, yet it’s just beginning. I loved photographing their day, knowing their story and seeing the love they had for each other. You could see the joy they shared to be getting married surrounded by family and friends who watched them grow-up and grow more and more in love. Megan’s sister helped her get into her off-the-shoulder, lace sleeved gown. They were crying, she was crying, I was trying not to cry! It was emotional to watch her put on her grandmother’s pearls. These are the special moments that I love to capture. Megan and Caleb were so easy going, full of joy and excitement for their day. Just the kind of couple I love to photograph! You could tell how honest their love was and what this day meant to them. It was such an honor to be a part of it. Thank you both for asking me to come home to Missouri and capture this day with the two of you. I hope you treasure that day and these photographs as a reminder of how in love and loved you both are!